The TWAS (The World Academy of Sciences) conference finished today, Bai Chunli, its next president and the president of Chinese Academy of Sciences, working hard to make it a success. Bai told me, smiling, that he was very excited about the conference, so he never felt tired. “I’m satisfied with the conference, because the meeting has completed all the programmes we have arranged for it,” Bai said at the closing ceremony of TWAS 12th today. Before closing the conference, he expressed his thanks to all the participants and speakers for their participation and contributions. In particular, he expressed his heartfelt appreciation to the Tianjin Municipal People’s Government and TWAS Secretariat. Without their full-support and hard work, the conference would not have been such a big success, he said. The conference saw TWAS changing its name to The World Academy of Sciences; and pledges of US$1.5 million to TWAS from the Chinese president. 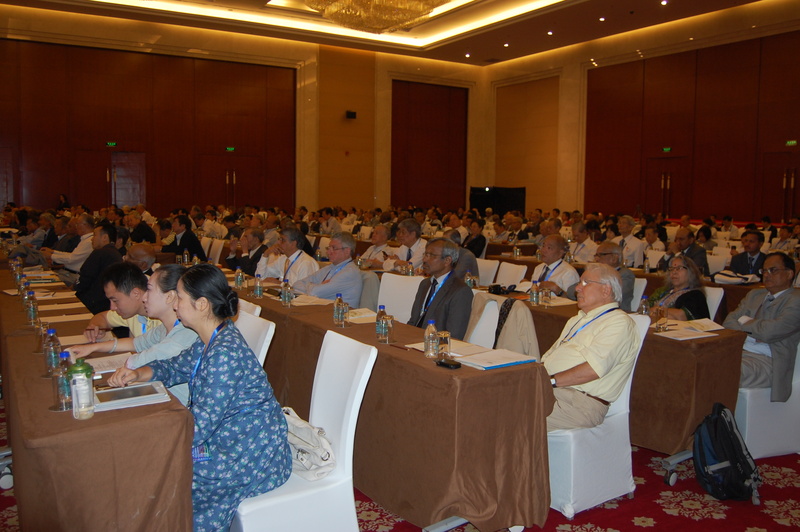 This blog post is part of our TWAS 12th General Meeting blog, which takes place 18 and 21 September 2012, in Tianjin, China. To read news and analysis on South-South cooperation please visit our website. Academician M.H.A. Hassan, the former director of the TWAS, made a speech during the Abdus Salam Medal Lecture yesterday that delegates are still talking about. Hassan spoke about TWAS and the future of science in the developing world, and said that the organisation’s strategic aims should be promoting international co-operation and global partnerships. He took session participants through TWAS’s major events from 1983-2012, its strategic aims and programmes; its future directions; and its global challenges. Some of the organisation’s achievements include rewarding outstanding scientists in developing countries; supporting young scientists and research groups in S&T-lagging countries; promoting South-South exchanges and postgraduate education; and promoting information dissemination and the exchange of best practices. Currently, the organisation has 1,028 members from 91 countries. Promoting the pursuit of scientific excellence and fostering the next generation of leaders in STI in developing countries has been at the core of TWAS operation for the past three decades, Hassan said. During breakfast this morning, it was announced that TWAS — which was originally known as the Third World Academy of Sciences and changed its name to the Academy of Sciences for the Developing World in 2004 — will henceforth been known as The World Academy of Sciences. “All members of TWAS support the new change,” said Zhang Kan, former director of the Institute of Psychology, part of the Chinese Academy of Sciences (CAS), who attended a closed session at the TWAS conference yesterday. He added that, in addition to supporting the change of name, TWAS members were eager to discuss the implications of the change. For example, Zhang said that the new name now means that TWAS welcomes members from developed countries. Currently, there are just over 1,000 TWAS members, 85 per cent of them from developing countries (developed country scientists may join as ‘associate fellows’) and Zhang expects this figure to rise as members from developed countries start joining. “Global collaboration is very important for scientific research,” he said. He gave the example of the Jiaolong, China’s manned deep-diving submersible. The vessel is the world’s first manned vehicle designed to reach a depth of 7,000 metres below sea level. It can be used in 99.8 per cent of the world’s seas. ” There are many other such examples, which show that research in developing countries is of an excellent standard,” he said. Mohammed Hassan, the former director of TWAS, said that the strategic aims of the organisation should include promoting international cooperation and global partnerships. Hu Jintao, the President of China, pledged US$1.5 million to TWAS to further boost scientific research in developing countries during yesterday’s keynote speech. A session this morning on ‘Advances in China’s Lunar Exploration’ was introduced by China’s chief lunar exploration scientist and pioneer in astro-chemistry, Ouyang Zi-Yuan, also known as the ‘Father of Chang’E’ (Chinese unmanned lunar probe). I have interviewed him many times in the past decade and found him to be a very nice, patient scientist. At the meeting he introduced the long-term plans for China’s lunar mission, Chang’E-1 and its scientific results, and Chang’E-2. He also talked about some of the science behind China’s future lunar exploration. Ouyang said that China’s unmanned lunar exploration programme has three steps: orbiting the moon (which took place in 2007); soft-landing on the moon (planned to take place between 2010 and 2013); and a mission to bring back samples from the Moon (planned for some time between 2015 and 2017). Chang’E-1, the lunar orbiter mission, was successfully launched as scheduled on October 24, 2007. Its main objective was to detect and study scientific questions relating to the whole moon. It carried out topographical studies of the entire lunar surface. These led to the production of a three-dimensional map of lunar resources; the analysis of the distribution and abundance of major elements and minerals on the lunar surface; a survey of the moon’s ‘brightness temperature’ and other properties and a calculation of the thickness of the lunar regolith (material covering solid rock). The mission also probed the space environment around the moon. Ouyang said that after launch, the Chang’E-1 orbiter took 13 days and 14 hours to complete its mission, clocking up a total flight distance of 2,090,000 km. China’s lunar exploration in coming years will start around 2013 with the Chang’E-3, which will be a landing and roving exploration mission. Ouyang said that the implementation of lunar orbiting, the lunar surface landing and rover exploration and the lunar sample return would all help to accumulate experience and to develop new technology for future manned lunar landing and lunar base construction. The universities of tomorrow will be ranked not just on the basis of research and PhD output but also by their contributions to socio-economic development, he said. While this provides great opportunity, it also poses challenges, particularly around quality, access and relevance. “In this fast changing world, developing countries need to invest in science, technology and innovation in order to rid themselves of poverty and hunger and stand with dignity in the comity of nations,” Rahman told SciDev.Net. “In order to promote innovation we must train our students to think in a problem-solving manner, and link research with industrial and agricultural development. For this it is important to establish technology parks, have venture capital funds and promote private sector research and development. It is only through such measures that the process of socio-economic development can be promoted,” Rahman said. 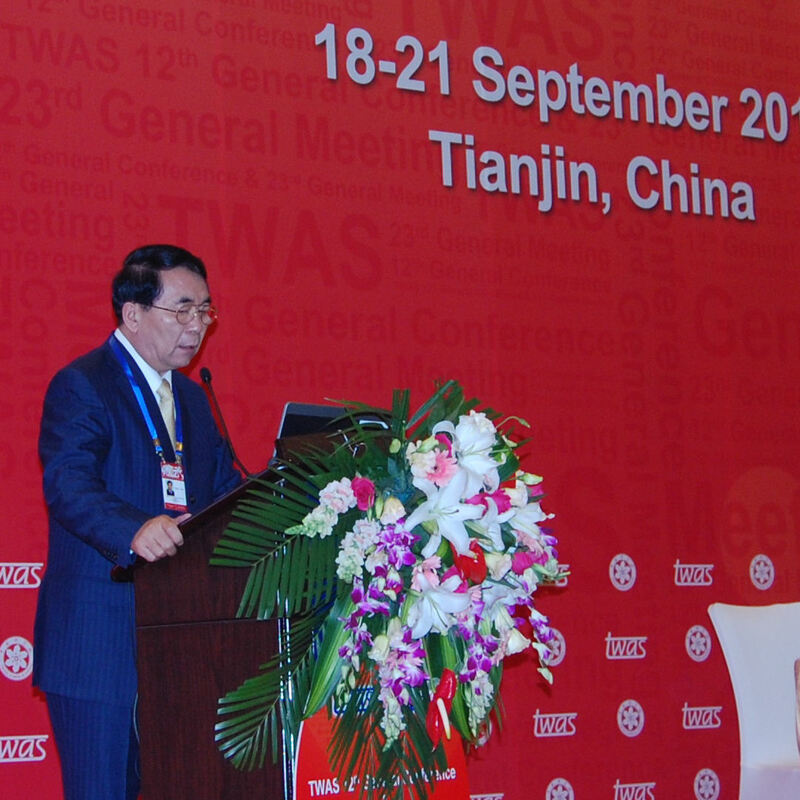 This blog post is part of our TWAS 12th General Meeting blog, which takes place between 18 and 21 September 2012, in Tianjin, China. To read news and analysis on South-South cooperation please visit our website. The Chinese president, Hu Jintao, surprised attendees with an appearance at the opening ceremony of the conference this afternoon in the Tianjin Great Hall. He presented several TWAS prizes to scientists from the developing world, including the TWAS Regional Prizes in Building Scientific Institutions; the Ernesto Illy Trieste Science Prize; and first ever TWAS-Celso Furtado Prize in Social Sciences. Hu told the meeting that “China will help developing countries build science research equipment and technology demonstration platform”. One of the winners, Jason Yi-Bing Lin, senior vice-president of National Chiao Tung University in Taiwan told me: “I’m inspired by the President of China, Hu, presenting me [with my certificate] and I’ll continue to work hard”. He said that the TWAS 23rd General Meeting has been very inspiring so far, and will help promote the cooperation of scientists from different developing countries. Another winner, Valakunja Nagaraja — from the Department of Microbiology and Cell Biology at the Indian Institute of Science in Bangalore — said he was surprised to accept his certificate from the president and shake hands with him. “I was very excited,” he said. Samar Hasnain from Pakistan, who has been a member of TWAS for almost twenty years, said the fact that “Hu attended the meeting seems [to imply that the] Chinese government pays great attention to developing countries’ cooperation and especially pays great attention to science research”. Bai Chunli, the president of the Chinese Academy of Sciences (CAS), was elected today as the next president of the Academy of Sciences for the Developing World (TWAS) and will take up his position in January 2013. 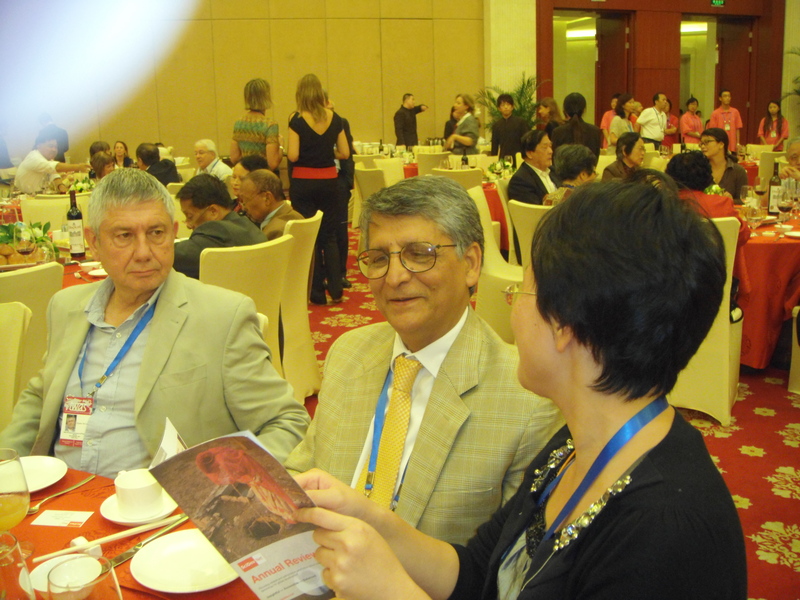 Bai is a well-known chemist and leading nanoscientist, and was appointed executive vice-president of CAS in 2004. He has also served as Vice-President of the China Association for Science and Technology (CAST), president of the Graduate University of CAS (GUCAS), director of the Academic Division of Chemistry, and a member of the Executive Committee of the Presidium of the Academic Divisions of CAS. On a personal note, I felt very embarrassed today. It turns out that I am not actually allowed to attend the closed sessions at the conference. But that won’t stop me reporting from the public parts of this meeting, so keep reading! You are currently browsing the archives for the TWAS 23rd General Meeting 2012 category.